I have some archived film from the 1980s taken in the old NHC building on Dixie Highway. That sure looks like you in the operations area. That is me. My first visit to the hurricane center was when I was 10 or 11 as part of a tour. Until then, I had called into here a lot. But I liked the tour so much that I came back again each of the following two years for more tours. During my last one when I was in junior high, I ran into hurricane forecaster Gil Clark. He invited me to come to NHC on Saturdays, and he offered to show me a thing to two. That is quite an opportunity. What did he have you do? Gil showed me how to plot analyses. This was 1985, and I was here a lot during the hurricane season. I remember (Hurricanes) Danny, Elena and Gloria. It was early on in the season and I had only come up just a few times, when a forecaster from the Miami forecast office pointed me out to (NHC Director) Neil Frank, informing him that this was the guy who was calling here all of the time. Neil came over and kicked me out. I would have been crushed! I was crushed. I was young and sensitive, and went down the elevator in tears. But wouldn't you know, Gil Clark came down the stairs after me. He said that he knew what happened, not to worry about it, and for me to come back in a few weeks. And I did. What about something more structured? When Bob Sheets took over as Director in the late '80s, I approached him about having some kind of apprenticeship while I was in high school. They hadn't had anything like that before, thought it over, and they agreed to an unpaid summer internship during '88 and '89. For those two summers, I was up here a lot. There were some big storms in those seasons. I remember Hurricane Gilbert in '88 and Hugo in '89. In fact, I was invited to go on that first Hurricane Hunter flight into the storm, which turned out be to a troubled flight. Luckily, my mom would not let me go. You obviously had no problem deciding on a college major. I went to Florida State University for my undergraduate work in meteorology, but I got bored with it, believe it or not. There was a lot of math and physics, maybe a little too much, so I began taking Spanish courses. I ended up with double major in Meteorology and in Spanish. I considered getting a Master's in Spanish, but didn't know what I would do with it. 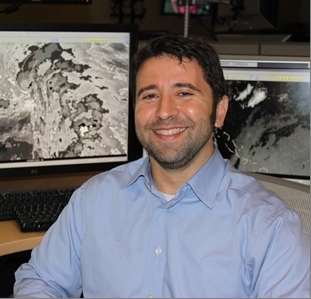 I got my Master's in Meteorology, and then in '96 began the Ph.D. program. Dr. William Gray came to FSU to give an invited talk. He mentioned that was out of graduate students and was looking for some to work for him. My academic advisor, Dr. Elsner, had been a rival of Dr. Gray's in the tropical cyclone community for some time. But Elsner graciously let Gray have me, a very selfless act in my book. It was cold! Normally, you don't get a lot of snow in Ft. Collins, but they had 11 inches on the ground when I first arrived and it was 3 below! It was a rude awakening. I took all of the coursework, and worked under Gray doing seasonal hurricane forecasting, something I was doing a lot of at FSU under Elsner. Things were going well, and then I had an accident. I severely injured my shoulder doing weightlifting. My injury required three surgeries in a six month period. Luckily, all of my coursework was done, but I still had the candidacy exam to take. I took it on pain medication and came up one point short the first time. I took it again, and again missed it by a point. Despite everything, they wouldn't make allowances and I had to leave. They've changed the rules regarding the qualifying exam since that time, but right now I have had no desire to go back. Now you needed a job. While my shoulder was healing, I applied for government positions, and one at the Weather Channel. I had a friend who was a stockbroker in Denver and he suggested a new line of work in weather risk management. This new industry in financial services came about after the very strong El Nino event in 1997, which was not well-anticipated and had a lot of adverse effects in the financial markets. I took his advice and sent out my resume to some financial institutions, and got back several hits. One of them was Enron. The same. They flew me to Houston, grilled me during a 6-hour interview, and then offered a position to me. The next three years in the private sector was a real eye-opening experience. It was cut-throat, stressful, and there were very long hours. I became enchanted by how much money I could make if I stuck with a job in this line of work but reality soon struck. . I worked for Enron Dynengy, and XL Weather and Energy. All three had financial problems and I lost my job several times. The whole experience caused me to reconsider my job choices, to think differently and outside of the box. The average person in that line of work loses his job seven or eight times during a career, and I had already lost it three times. It was too topsy-turvy for me and I had misgivings about a career in a for-profit industry. I also needed some stability, so I applied for government jobs in hopes of pursuing my childhood dream. It took seven months. It was an intern position at the National Weather Service office in San Juan. But there was also a forecaster position open, and I applied for that the moment I arrived and got that job a month later. But for a number of reasons, I decided San Juan was not for me and I transferred to the Hydrometeorological Prediction Center (HPC) near Washington DC.I stayed there for three years and found myself involved in doing surface analysis, short- and medium-range conference calls, winter weather forecasting and the list goes on. They do the whole spiel. I was on a number of coordination calls with NHC, and wanted to impress them. I was part of a hurricane liaison team in 2006 that was assembled ahead of "Ernesto". I was assigned to assist with Spanish media interviews. While here, I made sure I had my ducks in a row, and I finally got a Tropical Analysis and Forecast Branch (TAFB) position late the next year, and then became a Hurricane Specialist in 2008. I have always enjoyed the excitement. Following a hurricane in real time at NHC is an adrenaline rush, and being part of the forecast process makes it all the more satisfying. Several of us are always concerned about the long-range predictions, going as far as possible in terms of predictability. We've come a long way, and my excitement is from the fact that even though we tend to know more, we don't know everything (and there is more to learn?). When I was young and growing up in Miami, I always wanted a hurricane to hit here. I wasn't in Miami for Andrew, but I drove down from school a few days after its landfall after not hearing any word from my parents for days. I brought food/supplies, etc., hoping to help. When I arrived, I couldn't even find my house. No landmarks, no anything. I chased a few hurricanes after that in the mid '90s for the thrill, but realized by then that I never wanted to see a hurricane of any considerable strength strike me or anyone I hold dear. My excitement now comes from knowing that, as a hurricane forecaster, I have my chance to warn and help people if they will listen (in English or in Spanish). So you've come a long way, haven't you? We all have our own personal journeys. The message in mine, I think, especially for young folks who have dream is to never give up. Hard work and determination are keys to success. The shift-work is difficult. It puts a crimp in your social life and it is very hard on the body. What's your greatest challenge as a hurricane forecaster? I've been around (senior forecasters and my mentors) Richard Pasch and Jack Beven for a while now. I've learned so much from them, and consider them giants compared to me. My challenge and goal are to be more like them. I always thought that, if I could secure a position at NHC, then I would remain for the rest of my career. There is still part of me that thinks that, but you know what? Life does not work that way, and there are always things that are unforeseen. I don't know what it would be, but I am open to doing something else. Can you turn it off when you leave the building? Absolutely, without hesitation! When I was in high school, I was non-stop weather. I took my weather radio everywhere I went. When I got to college, things changed and have never been the same. There are many things in life that are I find just as enjoyable. I read a lot, am physically active with running and weightlifting, and very involved in politics but outside of the mainstream. I also love growing things. Since I was very young, my dad has had some fruit groves. I learned a lot about horticulture and botany through him. My mom and sister are dieticians, so I learned to eat well from both of them. My dream would be to have my own plot of land, about five acres somewhere in the Redlands, and grow every known tropical fruit tree and one of every known variety of mangoes.